In today’s tutorial, we will show you how to install and Cacti on a Debian 9 server. Cacti is an open-source, web-based network graphing solution written in PHP and build on top of the industry-standard data logging tool RRDtool. Cacti stores all of the necessary information in a MySQL database and allows a user to poll services at predetermined intervals and graph the resulting data using RRDtool. This guide should work on other Linux VPS systems as well, but was tested and written for a Debian 9 VPS. We will the install MariaDB 10.1 server from the official Debian repositories, you can skip this step if MariaDB/MySQL server is already installed on your machine. Once Apache, PHP, and MariaDB are installed, we can proceed with the Cacti installation. The easiest way to install Cacti on Debian 9 is to use the Cacti deb package from the Debian’s apt repository. The installation will now prompt you to answer a series of questions. Select "None" if you would like to configure the web server manually. mysql -u root -p -D cacti -e "update user_auth set password=md5('your_new_admin_password') where username='admin';"
That’s it. You have successfully installed Cacti on your Debian 9 VPS. Now you can login to the Cacti web interface at http://YOUR_IP/cacti using username admin and password your_new_admin_password. For more information about how to configure and manage your Cacti installation, please refer to the official Cacti documentation. 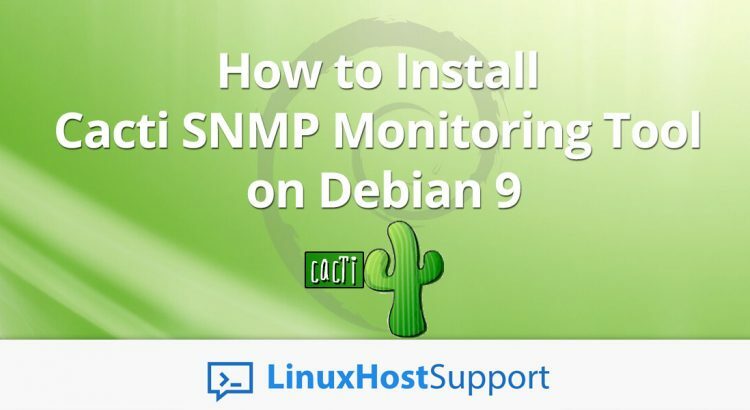 Of course, you don’t have to install Cacti SNMP Monitoring Tool on Debian 9, if you use one of our outsourced server support services, in which case you can simply ask our expert Linux admins to install Cacti SNMP Monitoring Tool on Debian 9r. They are available 24×7 and will take care of your request immediately. PS. If you liked this post on how to install Cacti SNMP Monitoring Tool on Debian 9, please share it with your friends on the social networks using the buttons on the left or simply leave a reply below. Thanks.